Temple Square in downtown Salt Lake City is the number-one tourist site for all of Utah. More tourists come here than Zion. More than Bryce. And even more than Moab. Fly into Salt Lake City’s International Airport and, with few spare hours, it is possible to be picked up at the airport in an LDS Church-owned van for a trip to tour Temple Square. Mormon missionaries–mostly female–will do their best to get the address and phone information from nonmembers in order to have missionaries visit them when the visitors get home. Ingenious. 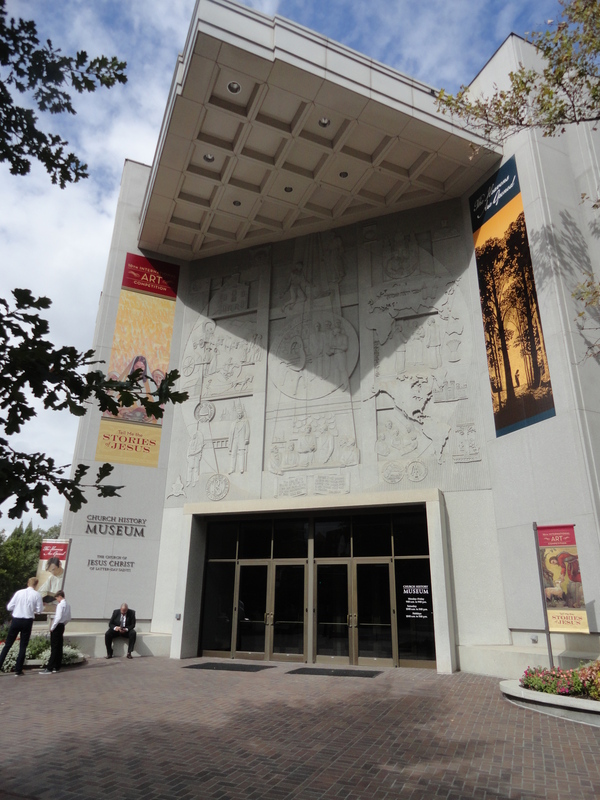 A few days before the LDS Church gathered for the October 2015 General Conference, the Church History Museum was reopened after a full year of remodeling. The basement floor–which includes a theater–was unchanged, and for the most part so was the second story, which still contains displays featuring each of Mormonism’s prophets as well as an interactive children’s museum and plenty of paintings. However, the main floor was completely revamped, with the latest technological museum displays and interactive set-ups added. We weren’t sure just what would be changed, so we were very curious when we visited the museum on Saturday morning, October 3, 2015 . The crux of this article will be to display photos from our visit and some analysis of several exhibits. The very existence of this museum centers around the man Joseph Smith. “Has revelation ceased?” one display asked. “Are miracles no more? Has reason replaced faith?” Obviously, the answer is NO! NO! NO! While they might define “revelation,” “miracles,” and “reason” and “faith” differently, most Evangelical and Protestant Christians going through this museum will have no problem with this. Of course, God can still have revelation today. (We call it a “special revelation,” which is the Bible.) If God wants to work miracles, couldn’t an omnipotent God do so? And aren’t we supposed to have faith? Yes, of course. This panel is helpful to help get the visitor’s guard down. Smith’s story from the beginning is emphasized. The painting to the right depicts Joseph Smith’s supposed 1823 visit from the Angel Moroni, who as the story goes was the last Nephite from 14 centuries before. I always find it interesting how Smith could have this magnificent angel of light visit him, lighting up the room, and a conversation took place while his brothers supposedly slept! Called “the keystone” of the Mormon religion, the Book of Mormon plays a prominent role in the museum. Nobody could leave the museum and not understand how important this story is to the LDS religion itself. 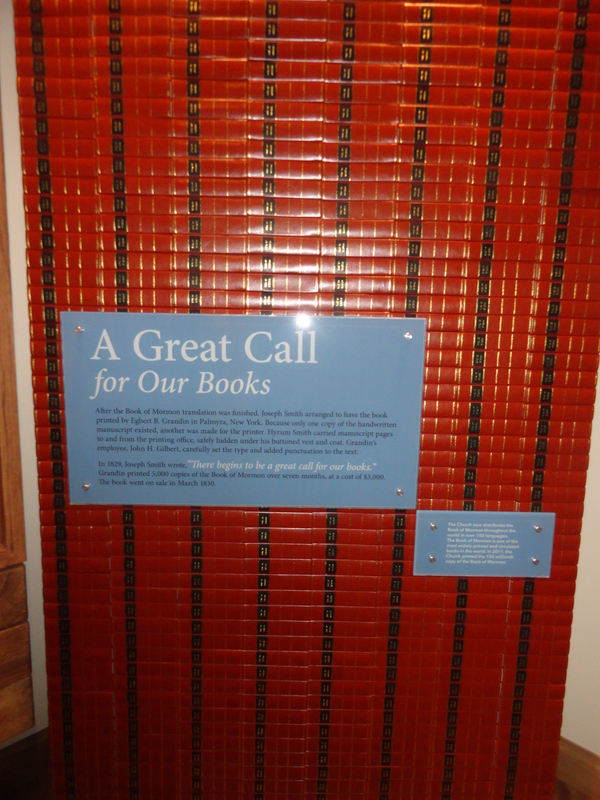 For instance, the picture at the right shows a display of replicas representing the 1830 edition of the Book of Mormon. The printing press that was originally used to print the first edition is also on display, just as it had been in the previous museum. I asked him if this information would change his mind about the weight of the plates. After all, if the plates really were made of gold, the size of the plates–one-sixth of a cubit foot as described by Smith–would equal about 200 pounds, since gold weighs about 1200 pounds per cubit foot. “That would be impossible to carry,” the museum employee said. “They had to have weighed much less.” Even if the plates were made with sheet metal, I told him, they would be at least 80 pounds. Even that number was too much for Joe. “I have to go with Martin Harris saying they were 40 or 50 pounds,” he concluded, while he admitted that he couldn’t explain how they could have been this light. It was obvious the sign “What were the Golden Plates Like?” is deceptive. Somehow, though, I think that any changes in the signage won’t be happening any time soon. Can you lift the plates? The reactions of Mormons who attempt to lift the “gold” plates used by Bill McKeever before a June 2014 Mormon Miracle Pageant in Manti. How Heavy Were Joseph Smith’s Gold Plates (4:46): Bill McKeever explains in a conference talk how the Book of Mormon, if made of gold plates, would have weighed around 200 pounds. What about the Book of Mormon Witnesses and the Gold Plates (8:01): Bill McKeever answers questions about the gold plates in relationship with the witnesses. Filmed in 2011 at the Mormon Miracle Pageant..
More than a month before the museum opened, members from the church’s history department announced the unveiling of this stone In the October 2015 Ensign magazine, an article titled “Joseph the Seer” written by Richard E. Turley, Jr.–the Assistant Church Historian and Recorder–along with Robin S. Jensen and Mark Ashurst-McGee explained how, as the subtitle put it, “the historical record clarifies how Joseph Smith fulfilled his role as a seer and translated the Book of Mormon” (p. 49). The most visible sign of Joseph Smith’s role as a seer in the newly formed Church was the Book of Mormon, which he repeatedly explained was translated “by the gift and power of God.” Many of those closest to Joseph in the year before the Church’s organization had witnessed the process by which the Book of Mormon came forth and had some understanding of the meaning of the word seer (p. 49). The young Joseph Smith accepted such familiar folk ways of his day, including the idea of using seer stones to view lost or hidden objects. Joseph Smith had to know how to use physical instruments to translate. As a young man, he used a seer stone to find lost objects. But as he grew to understand his prophetic calling, he learned that he could use the seer stone, in addition to the spectacles, for the higher purpose of translating scripture. as white or clear in appearance, set in silver bows or rims like modern eyeglasses or spectacles, and connected to a large breastplate. As described, this seeric device would have been bulky. For so many years, the LDS Church did not explain the seer stone in formats easily accessible to the general public or its membership. However, now the church appears to be admitting the actual method of how the plates were supposedly translated. Still, with such an emphasis on this seer stone, no depiction of Smith using the stone in his hat while translating the Book of Mormon was displayed anywhere. My suggestion? Using the illustration to the right, give the visitor a choice: A or B. I would bet that the average Latter-day Saint would vote “B.” The perfect object lesson is have this person read the seer stone inscription. Instant education! For more information on this topic, watch Bill McKeever explain the Book of Mormon translation in the 10-minute YouTube video A Seer Stone and a Hat: “Translating the Book of Mormon. Monogamy is God’s standard for marriage unless He declares otherwise. In 1831, when Joseph Smith was making inspired revisions in the King James Version of the Bible, he asked God why He had permitted plural marriage in biblical times. God revealed that He had directed it for His own specific purposes, and then He commanded Joseph to live the principle and introduce it to the Saints. 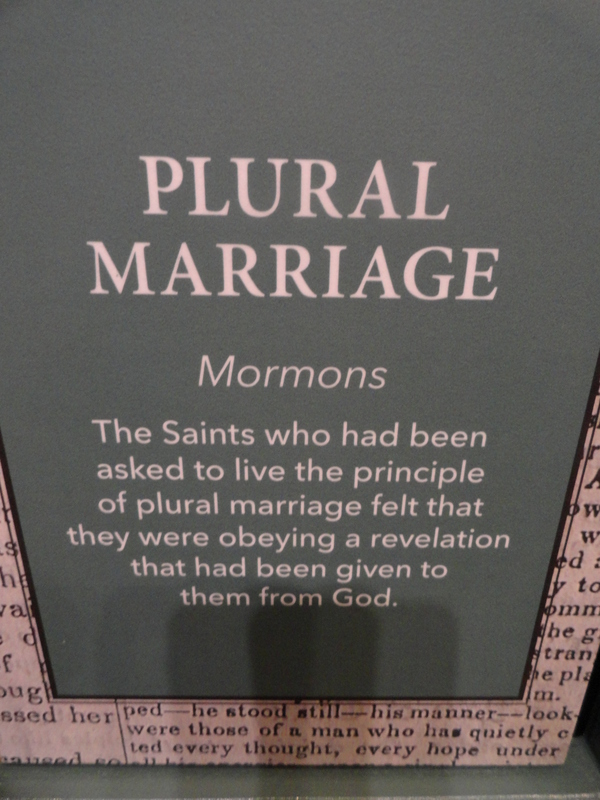 What many Latter-day Saints may not know is that Smith began practicing plural marriage in the early 1830s. Yet this teaching was never voted upon by the membership during his lifetime. D&C 132 did not become canonized until much later after Smith’s 1844 death. So how can we know that Smith was told by God to practice something that has never been accepted by Jews or Christians since the time of Christ? We must take the LDS Church’s word. When the full realization of the relationship between her friend Eliza and her husband Joseph came to her, Emma was stunned. She unquestionably reacted strongly, but the incident is so shrouded in Mormon folk talk and legend that it becomes difficult to determine what actually happened. Although no contemporary account of the incident between Emma and Eliza remains extant, evidence leads to the conclusion that some sort of physical confrontation occurred between the two women. 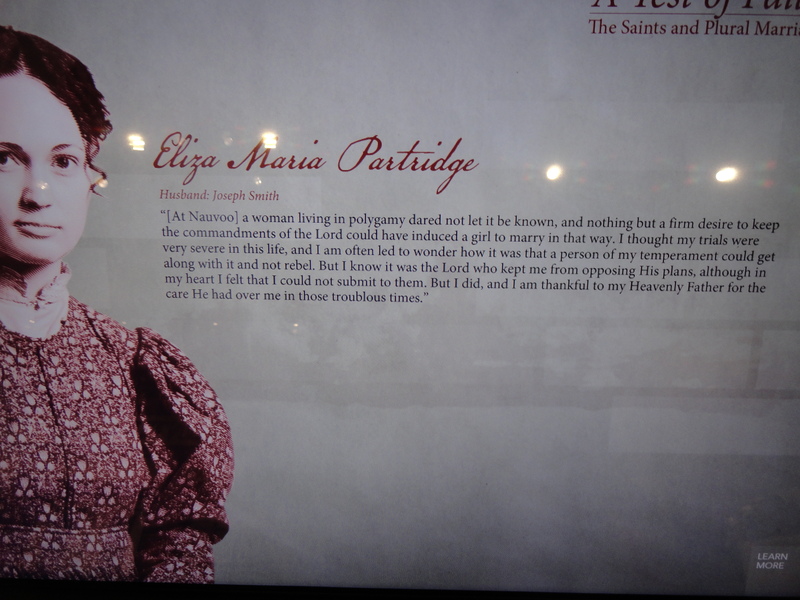 To say that Emma “vacillated” between accepting or rejecting plural marriage–as recorded on the slide referred to above– isn’t the whole story. Of course, none of what I have described here is talked about in the museum. 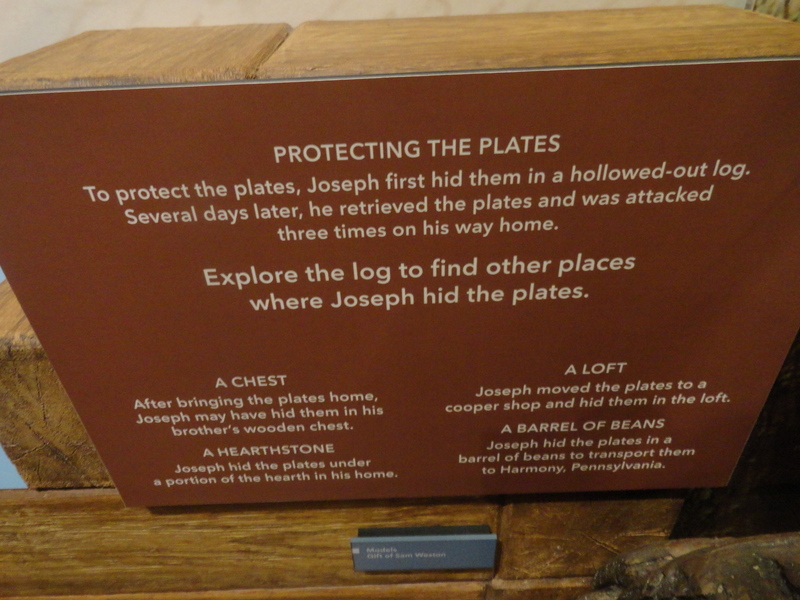 Probably the most interesting part of the museum is the section dealing with the “martydom” of Joseph Smith. A number of artifacts that had been in the old museum remain in the new version. For instance, the death masks of Joseph and Hyrum Smith are in a glass case that allows the viewer to walk around them and see all angles. 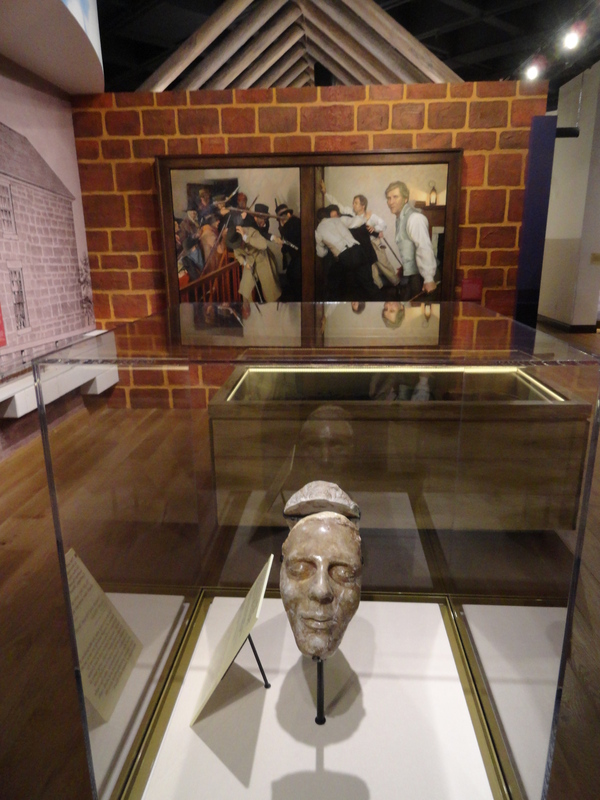 On the far left is the death mask of Joseph Smith, and to the far right is Hyrum Smith (who was shot at the bridge of his nose). The pocket watch (with a bullet hole) that saved John Taylor’s life is also prominently displayed, as the picture shows. And so are the two guns, one of which (the Pepperbox) that Joseph Smith used to shoot three people, two of whom died. According to John Taylor in the History of the Church, Joseph Smith “pulled the six-shooter left by Brother Wheelock from his pocket, opened the door slightly, and snapped the pistol six successive times; only three of the barrels, however, were discharged. I afterwards understood that two or three were wounded by these discharges, two of whom, I am informed, died” (History of the Church 7:102-103). The oil painting by Casey Childs (above), apparently commissioned by the church and took three years to complete, really surprised us. Portrayed on the left side of this full-wall painting are those face-darkened men belonging to the mob. On the other side of the door are Hyrum Smith, Dr. Willard Richards, John Taylor and Joseph Smith. At first, I didn’t notice, but then I saw pistols in the pockets of the two Smiths. See below. (Hyrum, who stands to the left of the three men at the door, has a gun, though it’s hard to see in my picture. Trust me, it is there.) Joseph’s pistol hangs out prominently in his left pocket. What is surprising about the return of the guns (they were included in the first museum) is how a scene at the annual Mormon Miracle Pageant in Manti, UT was changed back in the early 2000s that portrayed Joseph Smith opening up the prison door and firing the gun. Yet here in the mural the guns cannot be denied. Of course, no mention is made of Smith shooting anyone or anyone dying. The description with the painting reads, “A lethal shot was fired through the door, killing Hyrum. Seconds later, Joseph was also fatally hit.” Perhaps telling the whole story would be a bit too much for many faithful Latter-day Saints. Another interesting fact is that the Pepperbox revolver that was displayed in the original museum is a different gun from what is displayed in the new museum! Consider the bottom gun in the picture above (left), which is from the original museum. This is a Pepperbox pistol. Meanwhile, the picture to the right is from the newly remodeled museum. Notice how much shorter the top gun in this second picture is when compared with the bottom gun in the first picture. While we have heard that the gun in the second museum is the “right” gun, we are not quite sure why the original gun wasn’t placed in the first museum. How long have the church historians known about this? We only heard about this from a second-hand source. There were no signs to explain how this pistol was the real McCoy. The newly remodeled Church History Museum is going to confuse a lot of people. Why, for instance, are the church historians bringing out information that was never emphasized in the past (i.e. the seer stone)? Why are the plates called “golden” when they were really made of gold? And why display the guns smuggled into the Carthage Jail while portraying the famous murder scene with guns in Joseph’s and Hyrum’s pockets? In addition, the information here could end up causing Christians confusion, especially if they have limited understanding of Mormonism. Some may even be sympathetic to the history described in the museum and walk away thinking Mormonism and Christianity are synonymous terms. Either way, the reaction of those visiting this new museum will probably not be neutral, as people will walk out with either a positive or negative perspective. As for us, we will encourage people to visit the museum in hopes that a more accurate understanding of Mormonism might be garnered by those things the church is willing to tell.